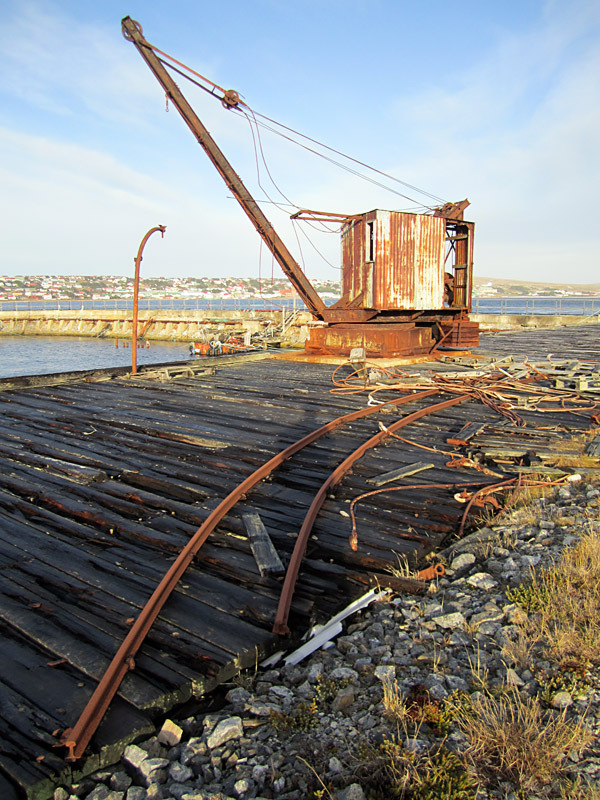 A 2 foot gauge line was built in 1915 to help in the construction of an Admiralty wireless station. It ran along the north side of Stanley harbour from the Camber depot at Navy Point to the new transmitters at Moody Brook. 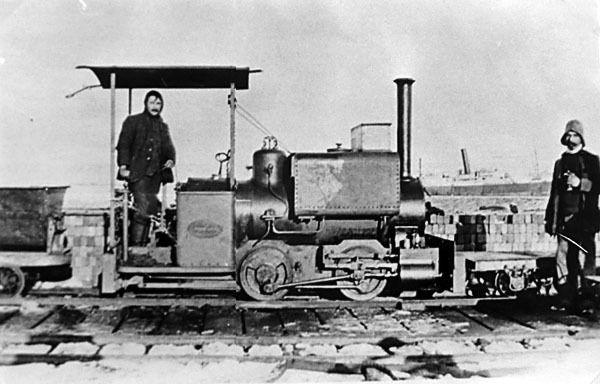 The railway was on the opposite side of the harbour from Stanley, and was around 3.5 miles long. It was built to help the construction and supply of a powerful Marconi radio transmitter installed to improve communications with the northern hemisphere following the naval engagements in the South Pacific and Atlantic in late 1914. 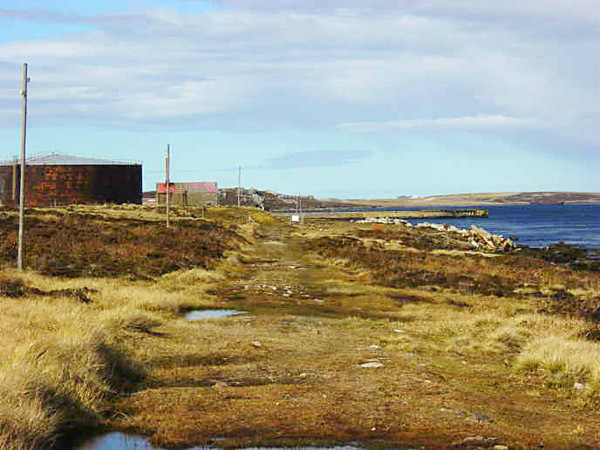 Two British capital ships had been sunk at Coronel, then four German ones in the Battle of the Falklands, leaving the 'Dresden' to carry out its notorious raiding campaign. 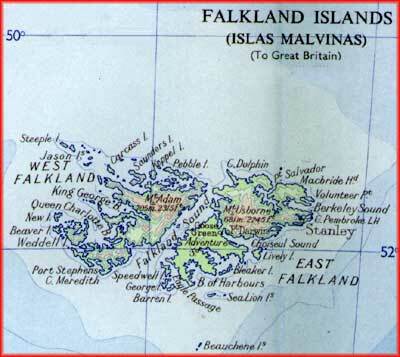 The 1957 map below shows the island group, with Stanley on the east coast of East Falkland. The island group is roughly 155 miles across (250 km.). An old Admiralty chart, below, shows the area of the railway in more detail. Stanley is lower right with the harbour running across from east to west north of the town. Above that is the long headland known as the Camber with Navy Point at its eastern end. Moody Brook, the site of the radio station, is at the far western end of the harbour. The water there is shallow and coal and materials were therefore to be unloaded at the Camber Depot on the harbour side of Navy Point. 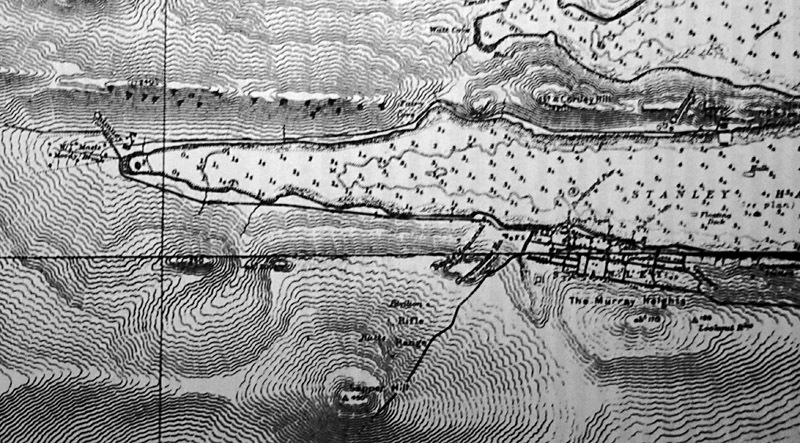 Hence the need for the railway, which shows up as a thin black line along the north side of the harbour. Construction work started in May of that year, involving the laying of a substantial stone base under the 'mainline'. 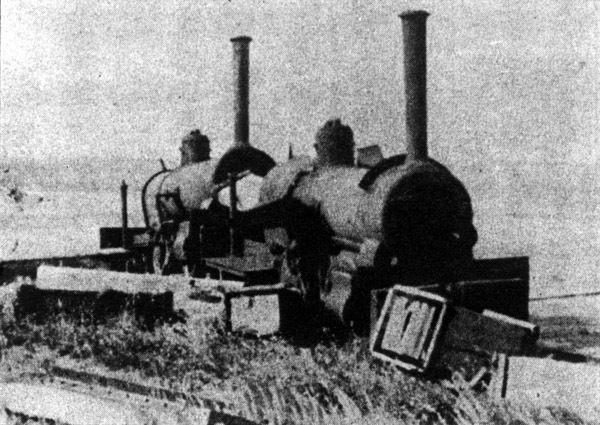 The locos had been despatched from Stoke in March (clearly considered an urgent project, as also indicated by the work in the Falklands continuing through the winter). 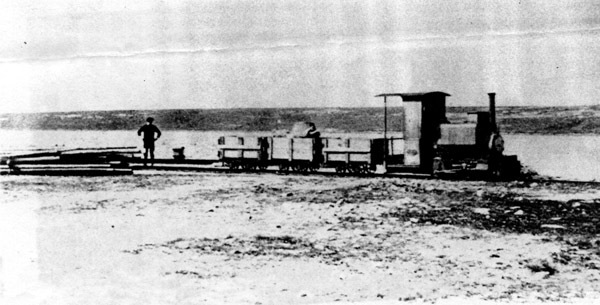 First trials of the transmitter were in April; the railway was completed about September. 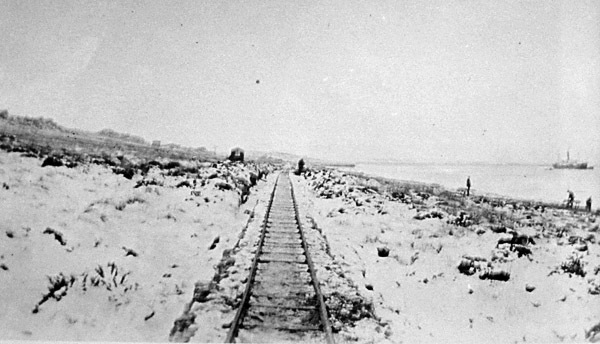 An undated view eastward along the railway track towards the Camber. After some discussion about building a jetty nearer to Moody Brook, the railway was left in place to take stores to the radio station, but fell into dereliction in the late 1920s. 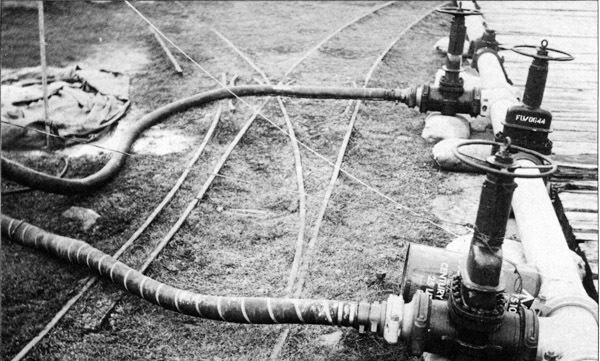 Some sources suggest that the line was maintained to supply coal to the radio station until it went over to diesel power generation in the late 1940s, but Professor Smith's researches make it clear that technical developments in radio transmitting had vastly reduced the power generation needed. There were two KS "Wren" class locos (KS 2388/15, 2392/15, of the early type with low boiler and inside valve gear, unlike later UK survivors, e.g. 'Pixie,' 'Peter Pan,' 'Lorna Doone'). Two photos below show a loco as new, and two with the addition of cab side screens and hauling the same three four wheeled wagons, though in one photo two of them have locally added woodwork ('lift-off?') forming seat backs for transport of workmen. The same photo shows 'Falkland Island Express' painted on the tank, and the hulk of the S.S. Great Britain dimly visible behind (This is the photo on which a Falklands stamp was based). The late Dr. Ben Fisher suggested that Kerr Stuart might have been particularly well placed to supply such locos at minimum notice on account of their habit of half-building locos for stock, which might also explain the non-consecutive works numbers?" Above: an early view showing one of the two 'Wren' class locos at the jetty. Note the open cab, less than appropriate for a Falklands winter. (Photo from Stanley Museum collection). This photo may well have been taken immediately after the unloading of the loco, whilst the ship in the background may even be the SS Ismailia which brought the railway and wireless station equipment out from Britain. The picture is also noteworthy for illustrating the two original types of wagon, a tipper on an inside bearing oval chassis seen on the left, and a flat wagon on a rectagular outside bearing chassis seen to the right. 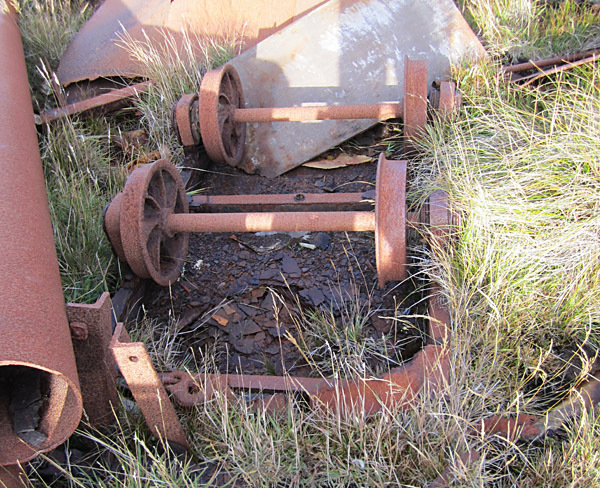 Both types of wagon ran on coil springs. Above: another view showing a newly-arrived Wren, and with the SS Ismailia in the right background. 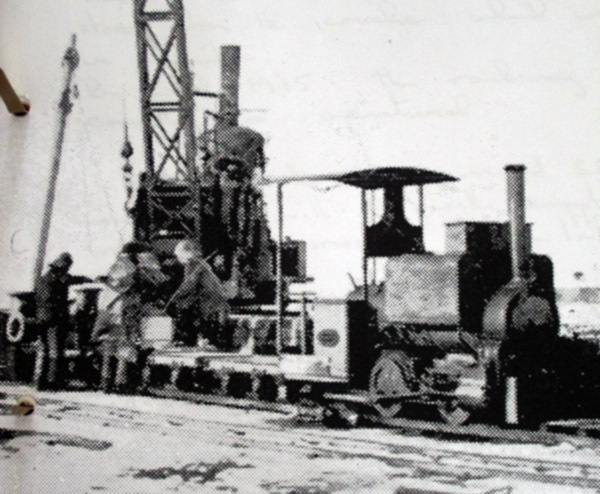 The steam crane is almost certainly the five ton crane sent out with the railway and wireless materials to aid unloading. 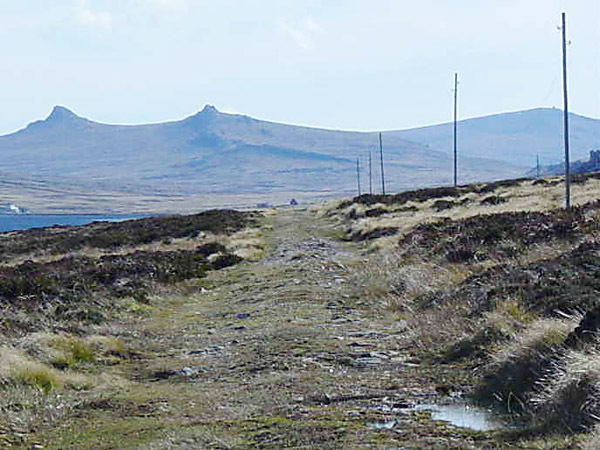 The photo that was later used on a Falkland Islands 54p stamp, as illustrated below. The loco has 'Falkland Island Express' on the tank, whilst the wooden wagon bodies carry removeable seats at each end for workmen. (Photo courtesy of Stanley Museum). The 1st class, 2nd class, 3rd class, and 'Smoker' legends, not to mention that on the loco's tank, seem to imply that the whole thing was seen as a bit of a joke. 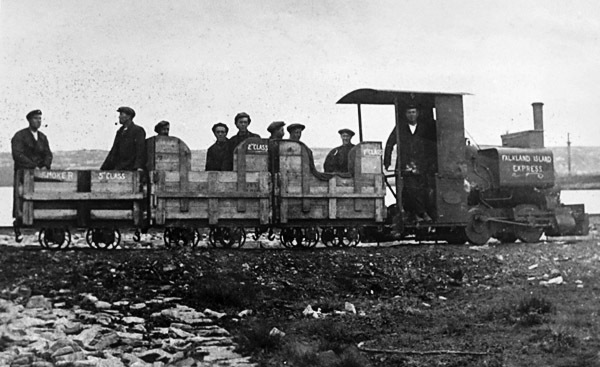 Railway workers in windy areas have occasionally rigged a mast and sail on a four-wheeled wagon. In the Falklands however this was elevated to a fine art. An early sail-driven wagon is pictured on one of the stamps shown below, but by the 1920s the design was more advanced. 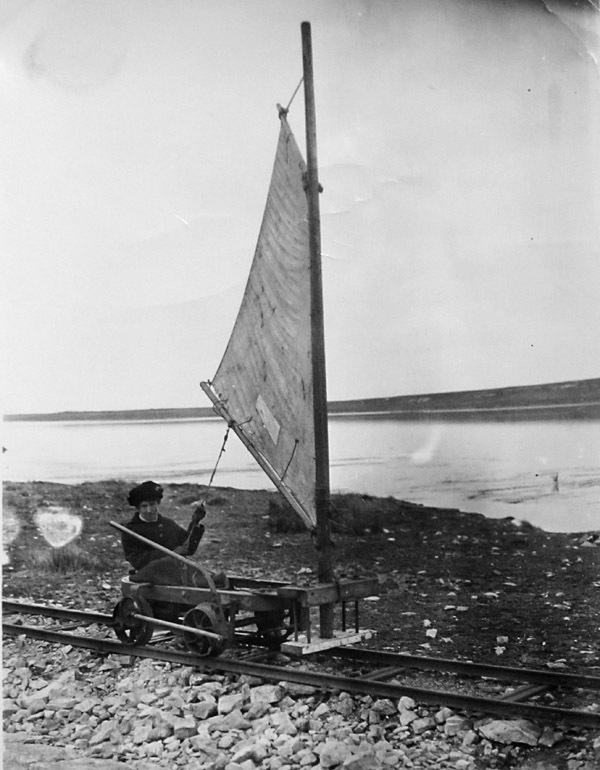 The photo below shows a wagon rigged with a single standing lugsail but with a lever geared to the back axle to permit hand-powered movement against the wind. Presumably the westerly winds made it easy to run down from Moody Brook to Navy Point but the return journey would have needed more effort. The photo is slightly puzzling in that the wagon appears to be facing west. Since tacking against the wind is clearly impossible on a railway line I would have expected the sail to have been arranged the other way round for west to east downwind 'running'. A further photo is shown below. A variety of balanced lug, standing lug and gaff rigs have been tried! 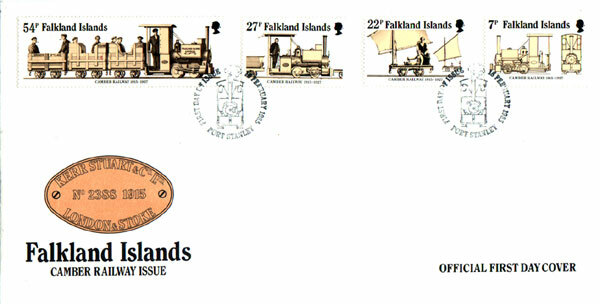 Much more recently, in 2005, the 90th anniversary of the railway has been commemorated by the issue of four stamps. These use four photographs chosen from this website, three old black and white pictures and one recent colour one by Zacchary Stephenson showing the trackbed in 2002. 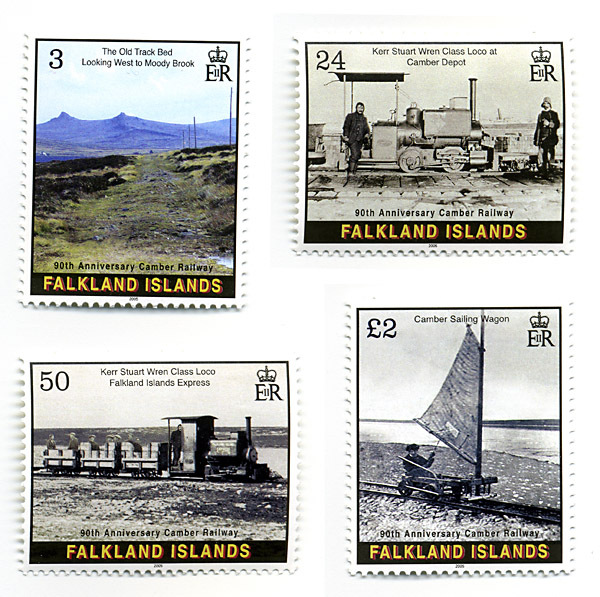 Stamps reproduced by courtesy of Creative Direction (Worldwide) Ltd and the Falkland Islands Post Office. Save the file to your desktop and double-click to decompress it. Open the folder and drag the KMZ file onto Google Earth's Places palette. You will now find that you have placemarks for each of the locations on this page, and a path to enable you to 'fly through' the Camber railway route as if in a helicopter. Select this path and click on the start button to commence the flight. • Camber railway A flight along the trackbed from the Camber to Moody Brook. Generally the route is clearer without the overlying vector path being checked and visible, but with the appropriate station placemarks checked. Flights or 'tours' in this website are best done with the Google Earth touring preferences set to a camera tilt angle of about 60 degrees, and a camera range of about 300m. 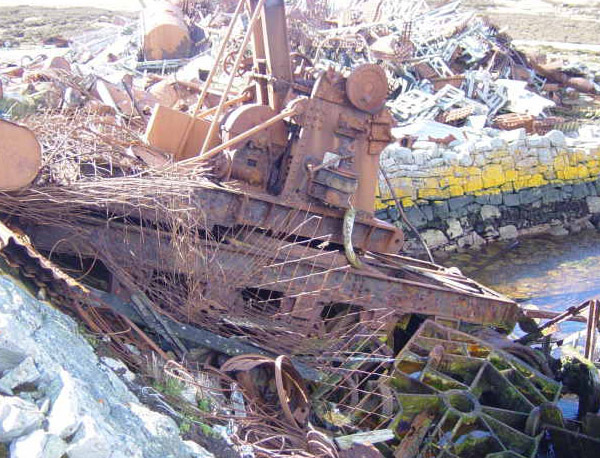 The two locos lie derelict at Navy Point in about 1943 (1). The saddle tanks have already disappeared, presumably to other uses. 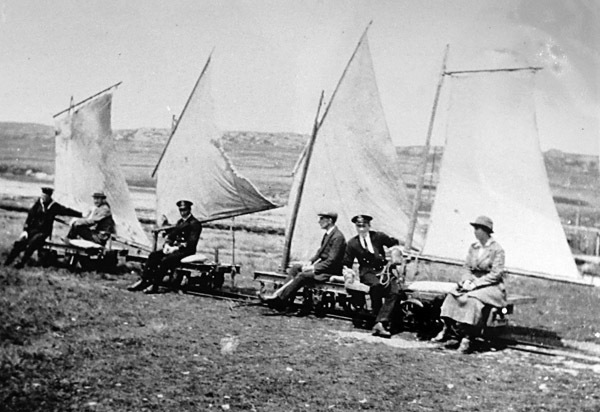 Although the line and its sail-powered wagons was used unofficially for many years by local children and others, eventually it seemed to have been almost forgotten, although rails found a variety of other uses as cattle grids and shed rafters. However, the 1982 conflict changed this along with everything else. BBC TV news broadcast maps at the time showed the railway line and this alerted a number of enthusiasts who, however, were initially too busy to bother about such details. Eventually, Richard Gardner, Raymond Selkirk and others explored the remains. Both of the above reported on their findings in issues of the Railway Magazine (2). At that time in late 1982 there were a number of sidings visible at the Camber with the remains of wagon turntables. Both steam locos were buried under a pile of scrap. Several wagons lay around and in the water. There was also a broad gauge steam crane. West of Navy Point the rails had all gone but a few sleepers still lay on what had become an unmade track. Some rails had been utilised during the conflict to support the roofs of Argentine bunkers on Wireless Ridge and elsewhere. A pair of wagon wheels lay at Moody Brook but the original wireless station buildings had become the Marines barracks for a time, and were destroyed by the Argentine forces who were under the mis-aprehension that this was still the case. please make sure you check on the locations of minefields. These are fenced and clearly labelled, as above. The Royal Engineers later undertook the recovery of both locos from the scrap dump and placed them inside containers for safety. 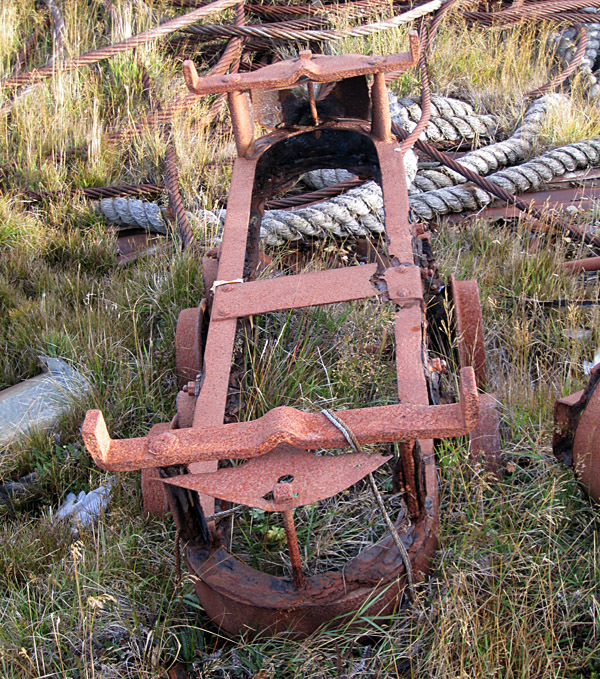 It was hoped that one or both of them could be restored and preserved, either out in the Falklands or back in Britain. 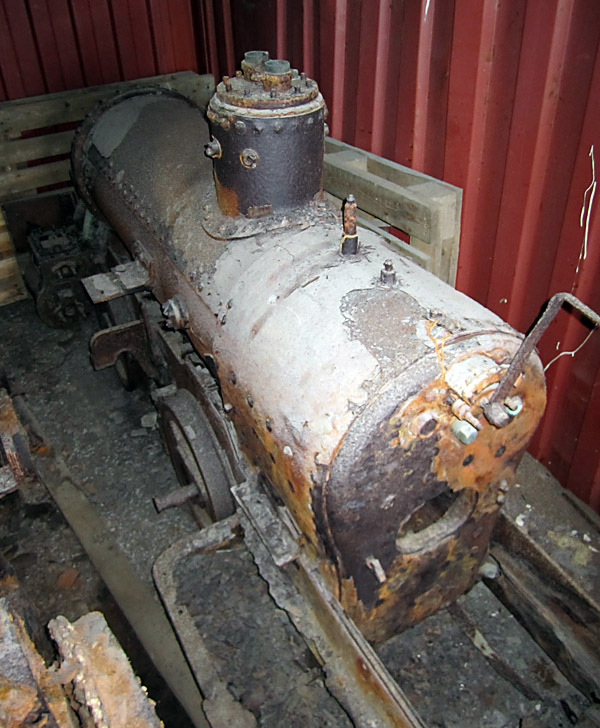 More recently a detailed proposal, for one loco to be restored and retained in Britain whilst the other would be conmetically restored and returned for preservation in the islands, was considered by the Falkland Islands Government but fell by the wayside owing to the world economic situation in 2010. The photo below shows one of the locos in its container in May 2011. It can be seen that the surviving remains are fairly basic after perhaps 85 years of decay in the open air. The sidings at Navy Point largely disappeared under new port facilities after 1982, with a good deal of material clearly having been bulldozed onto the beach below. Ironically the site has more recently been completely abandoned. Next to nothing is visible at Moody Brook apart from the anchors for the cables which once stayed the wireless masts, and the concrete bases of the buildings. A number of photos taken in 2002 by Zachary Stephenson have been forwarded through the kind agency of André Philipsz of the Britlink website. Several of these are shown below. On the left is a solitary wooden sleeper and one track spike, found at the Camber. 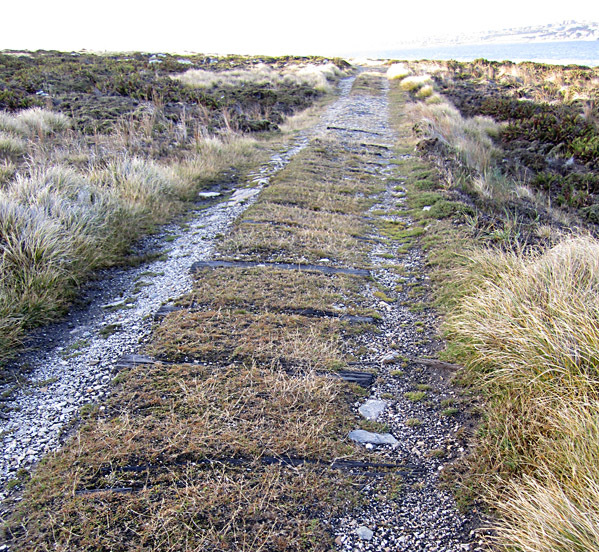 The trackbed can be easily followed on foot or by mountain bike. If driving a 4x4 along the route, take especial care at Fairy Cove where the track makes a curve away from the shore following the contour. This section is extremely boggy and should be bypassed by a more solid route closer to the shoreline. 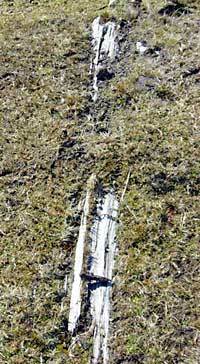 The trackbed is still clearly visible. The view below looks east towards the Camber and Navy Point. In the opposite direction, looking west to Moody Brook. A section of the trackbed as seen in May 2011, in this case with almost all sleepers still intact. At the Camber, there was little track left in situ in May 2011, though this section of 2' gauge laid directly on the jetty timbers adjacent to the fixed diesel crane is an exception. The remains of a rectangular-framed flat wagon lie upside-down at the Camber in May 2011. Nearby lies the chassis of a skip wagon converted to 2' 6" gauge. Whilst the crane in the distance is not mounted on rails, the concrete longitudinals clearly hint at wider gauge track having been laid along the jetty at the Camber Depot. The twin lines are in fact about six feet apart. 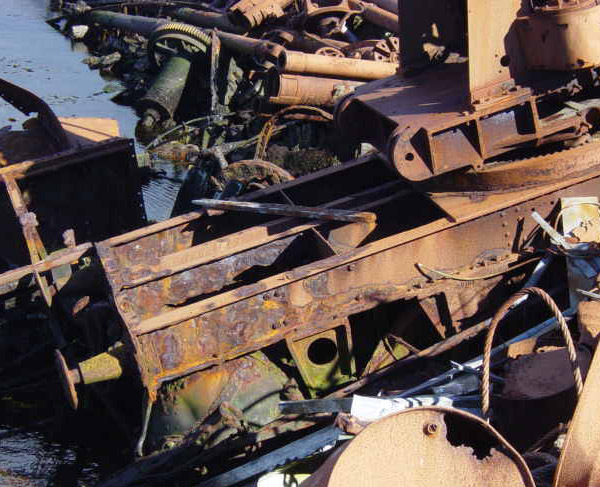 And tipped into the water nearby is the remains of a steam crane, by John Wilson of Birkenhead. This may well be the 'five ton crane' delivered in 1915 to help in the unloading of the wireless station materials. From the opposite side, it is clear that the crane has British style buffers, not perhaps necessary on a short quayside track but possibly indicating an off-the-peg design suitable also for shunting by a loco. 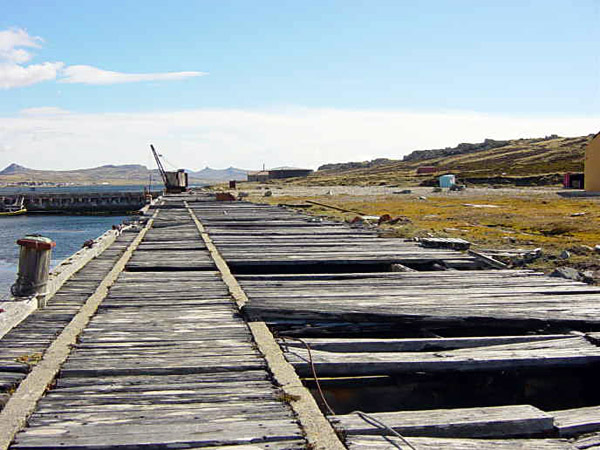 Whilst it is disappointing that the recent proposal to restore one of the locos cosmetically for display on the islands has come to naught, the plan to move the museum in Stanley to a larger and more central site in the old dockyard may yet give an opportunity to find it a safe home in which it can be appreciated by visitors to the Falklands. Further news will be awaited with interest. 1 Photo by the late T. E. Rounthwaite, from Norman Straker's collection, as reproduced in the Railway Magazine May 1985. 2 Articles in the Railway Magazine, November 1984 and March 1985. 3 The most complete source of information is an article by R. A. Smith published in 'The Narrow Gauge' no.108 (Autumn 1985), pp.13-5, Professor Smith has kindly given permission for the whole article to be attached as an appendix.